Someone asked me the other day why I choose to use Family Treemaker. Why not another genealogy software program? I couldn’t really answer, as when I picked Family Treemaker, it was many years ago and at the time it ticked all my boxes. I was already an ancestry.com convert and with family all over Australia I wanted to share what I had found. I wanted something I could use offline; when my internet went down. I wanted something that would print pedigree charts instead of me putting text boxes all over my word documents. And I wanted something that was easy to use. So I have sat down and had a good look at Family Treemaker to understand why it might appeal to others. Of course the biggest pro of Family Treemaker is it’s syncing ability with Ancestry.com. This means that if I find something or add information on Family Treemaker or Ancestry, it automatically saves between them when I sync. This is great for me, as I haven’t the time or patience to ensure that I am saving data in two places. However, to get the full advantage of the biggest pro for Family Treemaker, means that you need to pay the expense of having an Ancestry.com subscription which can be pricey. This fact alone about Family Treemaker may sway you either way already. Family Treemaker doesn’t have any version that they give away for free. You have to buy it, to try it. At around $60 for it’s deluxe edition, it’s around $20 more than it’s competitor Legacy. Also the upgrades can be around $30 and the upgrades were happening on a yearly basis. However this latest release has happened after two years and lots of requests to make the tree syncing better. If you want to upgrade every time something comes out, that’s up to you, but after reviewing what was new I really didn’t feel the need. I don’t think most people doing their family genealogy are sleeping out the front of stores to get the latest upgrade either. Tip: Make sure that you get the Australian and New Zealand version of the software. Getting started is so easy, with being able to either enter in the information I have, importing information from another source or syncing from Ancestry. Family Treemaker allows you to import files from Legacy Family Tree files, The Master Genealogist files (this software may be discontinued in 2015), and FamilySearch Personal Ancestral Files (PAFs) directly into Family Tree Maker; your files will contain all your information plus any media items you’ve included. If your file was created in another program, you can export your tree as a GEDCOM, which Family Tree Maker can open. I really like this, as even if I change my mind on using this software in the future I can still easily take a GEDCOM file to other software. Tip: Always make sure that any genealogy software you look at has the ability to convert GEDCOM files, otherwise don’t even consider it. Easy to use is the top of the list when I look at software I want to use. Family Treemaker is so easy to navigate. The whole program works on clicking the top tabs. The tabs are straightforward and get you straight to the information that you want. They do have great training tutorials but really the software is that easy to use that you might only use them to make sure you haven’t missed something. Another good point with Family Treemaker is being able to use it on an Ipad or android tablet or my smartphone when I am out. Other genealogy software programs like Legacy don’t automatically let you do this. You will need to find apps to be able to do this. Not all people are going to be interested in being able to do this, but I find it very handy when I happen to be out. Genealogy is a chance to get out to find more information and carrying a full binder is not always going to happen. Having a phone or tablet handy is increasingly going to be the way that genealogy is done. Many people use ancestry.com website and maintain their information in private trees, I don’t do this. But I was interested to note that Family Treemaker does make it easy to make information private. From clicking private on your whole tree in the program, to ticking private on any media items added. Although I don’t use this function myself I’m sure many people would find it comforting to know that they don’t need to have all their information out there. It was interesting to look through the features of a program that I use all the time. It’s also gives me many more reasons why I like using Family Treemaker. At the end of the day though it really is up to you and what you want out of a program. Sit down and think about what you want and then search through reviews of different programs. I find talking to others about why they use their software really good as sometimes they can bring up really good points that you may not have considered. I hope my article was useful and if you have any topics that you are interested in let me know in my comments box. Last updated by Nicol Warren at June 10, 2015 . 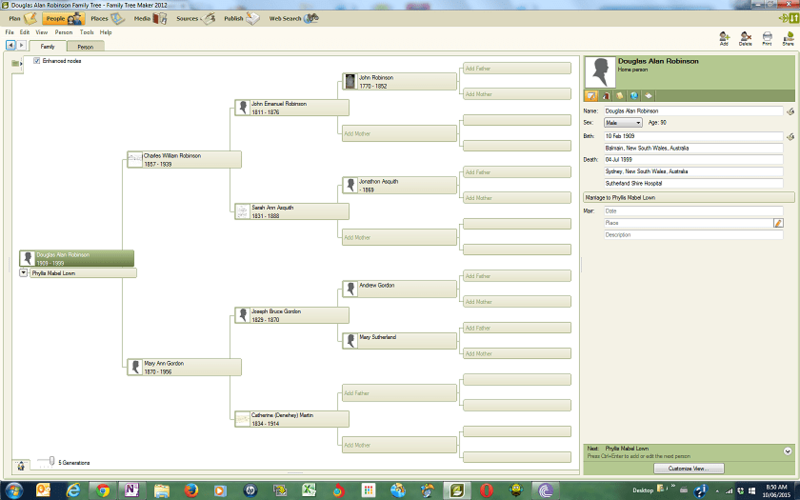 Family Treemaker, Genealogy software. Bookmark.